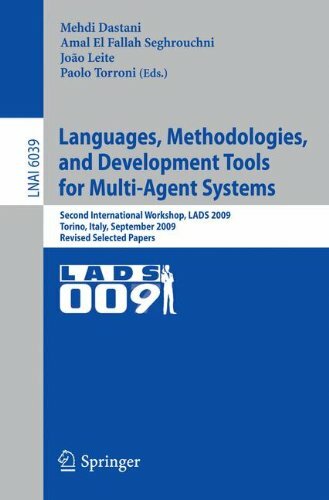 This book contains the proceedings of the Second International Workshop on Languages, Methodologies and Development Tools for Multi-agent Systems (LADS 2009), which took place during September 7–9, 2009 in Turin, Italy. As in its 2007 edition, this workshop was a part of MALLOW, a federation of workshops on Multi-Agent Logics, Languages, and Organizations. The LADS 2009 workshop addressed both theoretical and practical issues related to developing and deploying multi-agent systems. It constituted a rich forum where leading researchers from both academia and industry could share their experiencesonformalapproaches,programminglanguages,methodologies, tools andtechniques supporting the developmentanddeploymentof multi-agent systems.Fromatheoreticalpointofview,LADS2009aimedataddressingissues related to theories, methodologies, models and approaches that are needed to facilitate the development of multi-agent systems ensuring their predictability andveri?cation.Formaldeclarativemodelsandapproacheshavethe potentialof o?ering solutions for the speci?cation and design of multi-agent systems. From a practical point of view, LADS 2009 aimed at stimulating research and d- cussion on how multi-agent system speci?cations and designs can be e?ectively implemented and tested. This book is the result of a strict selection and review process. From 14 papers originally submitted to LADS 2009, and after 2 rounds of reviews, we selected 10 high-quality papers covering important topics related to multi-agent programming technology, such as: agent architectures, programming languages andmethodologies,socialinteractionmodels,developmenttoolsandapplications of multi-agent systems.